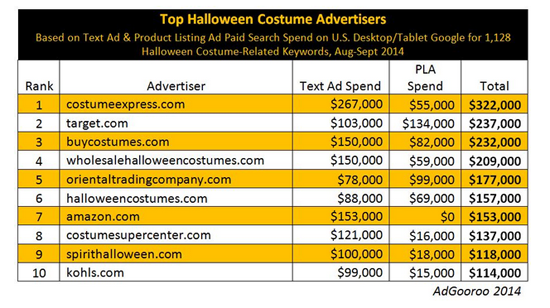 From who is spending the most to what people are searching for, AdGooroo examined 1,128 Halloween costume keywords for Text Ads and Product Listing Ads on U.S. Google AdWords Desktop/Tablet from August to September this year. It may not come as a surprise that Disney costumes top the list. 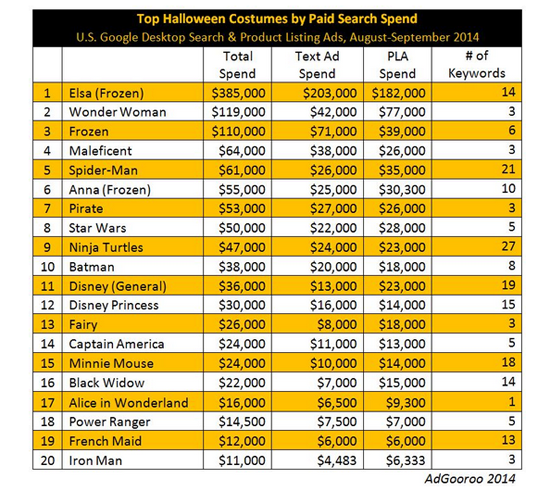 A look at the Top 20 Costumes by Paid Search spend includes plenty of Disney properties, such as Elsa (Frozen), Frozen, Anna (Frozen), Disney (General), Disney Pricess, Minnie Mouse and others. What might be most interesting to digital marketers, however, is what advertisers are spending to get in front of potential buyers. Based on this keyword set, CostumeExpress.com ($322,000) is the biggest spender, followed by Target ($237,000), BuyCostumes.com ($232,000), WholesaleHalloweenCostumes.com ($209,000) and Oriental Trading Company ($177,000). The bottom five advertisers in the ranking are HalloweenCostumers.com ($157,000), Amazon ($153,000), CostumeSuperCenter.com ($137,000), SpiritHalloween.com ($118,000) and Kohl’s ($114,000). Also interesting to note, according to AdGooroo, is that the top 10 advertisers spent 58 percent more on Text Ads ($1.3 million) than Product Listing Ads ($546,000) during August and September, but that's being driven by seasonal costume retailers. "In contrast, the only advertisers who are committing more budget to PLA than Text Ads are two large brands, Target and Oriental Trading Company, which are likely better-versed in PLAs than the smaller retailers and can readily employ the medium in their sales of seasonal merchandise such as Halloween costumes," wrote AdGooroo. "The outlier among major brands is Kohl’s, which only devoted around 15 percent of its search budget to PLAs. Amazon reportedly does not sponsor Product Listing Ads as a policy."